For someone who isn’t fond of mushy foods, there is one food that I will eat – especially if it’s mushy with a few lumps. I’m not exactly sure why, but mashed potatoes really warm my soul. Maybe that’s part of why southern cooking is soul food, for the stomach warming, taste bud pleasing mashed potatoes. If I go to a nice restaurant and they have garlic mashed potatoes on the menu, that’s what I’ll get instead of the traditional fries. The sad thing is that I only get to eat mashed potatoes when I do go out and I don’t make them while at home. One of the prohibitive things about making mashed potatoes is the time it takes to prepare. Time that this girl doesn’t have. 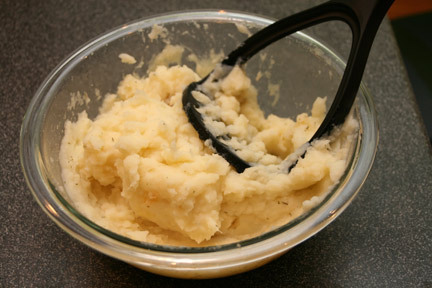 Ore-Ida has recently introduced a new, easier way to make mashed potatoes with their Steam n’ Mash products. The concept of Ore-Ida Steam n’ Mash Potatoes is simple. Available in four varieties: Cut Russet, Cut Red, Cut Sweet and Garlic Seasoned, Ore-Ida is giving us a short cut to delicious, freshly-made mashed potatoes by taking care of all of the time consuming work for us. Ore-Ida gives us a bag of frozen, prepared potatoes and we just need to cook them.The potatoes are already scrubbed, peeled, and chopped and are in the bag ready to be microwaved. To cook your Ore-Ida Steam n’ Mash Potatoes, simply steam the bag (without any tearing or poking holes) in the microwave for 10-20 minutes. Then, let the bag rest for 2 minutes before carefully removing the (very hot) bag from the microwave. 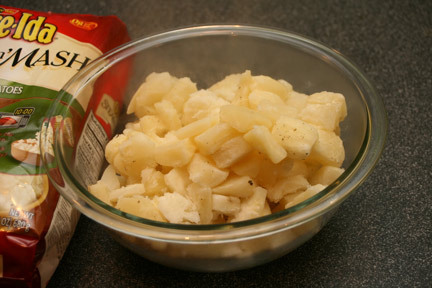 Cut open the top of the bag and then pour the potatoes out into a bowl. Next, add milk and butter and let the fun begin. I’m completely amazed that I have a potato masher in the house, but I do. You will want one for this because it makes things so much faster. If you don’t have a potato masher, you could try using a fork, but that may take awhile and won’t allow you to leave chunks if you want lumpy potatoes. In a matter of seconds, my Steam n’ Mash potatoes went from a bowl of cooked potatoes to a beautiful smooshy mass of potatoes. After mashing to my desired texture, I seasoned it with a little salt and it was good to go. Total time from freezer to table – 14 minutes. 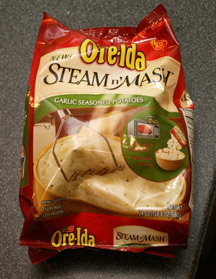 I tried the Garlic Seasoned Ore-Ida Steam n’ Mash and found it to be delicious. 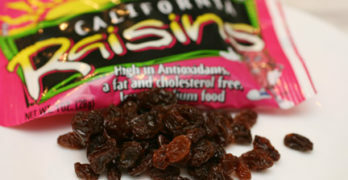 I found myself doing drive-by tastings as I was moving about the kitchen. A bite here, another bite there. It has just the right amount of garlic and wasn’t overpowering. I was happy to find the potatoes cooked up smoothly and evenly. They were easy to mash and the texture came out just right, with mostly smooth potatoes with a very occasional lump here and there. I love the peace of mind that comes from knowing these mashed potatoes were actually mashed potatoes instead of some magical potato powder. As an extra bonus cooking these potatoes gave the house a wonderful home-cooking aroma as well. To learn more about the new Ore-Ida Steam n’ Mash potatoes, cooking tips, and recipes visit www.steamnmash.com. To try them out for yourself, Ore-Ida Steam n’ Mash potatoes are available in stores nation-wide in the frozen food section. I found mine near the french fries. You can also enter to win the What’s Cooking at DD Ore-Ida Steam n’ Mash Giveaway! 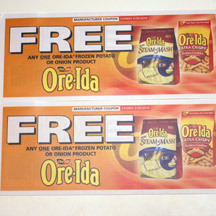 One winner will receive a TWO coupons for FREE Ore-Ida Steam n’ Mash products. Disclaimer: This post consists of my (and/or fellow tester) opinions only. Your experiences may be different. No compensation was given for this review/giveaway. I did receive a coupon for free Ore-Ida products from the manufacturer or their representing PR agency to use and test for the purposes of this review. This did not affect the outcome of this review. I would make the Crab Cakes with Russet Potatoes. I would love to try the steam and mash cut sweet potatoes.